From left to right: The author's grandfather; sister, Faith, age 15; mother, Karen; the author, age 14; and grandmother, Lucy. Photo courtesy of Myah Genung. I lived most of my childhood convinced that my grandfather, Calvin Muldrow, was Superman. On summer evenings, I’d perch atop his knee as we sat on the creaky back porch of his red brick house in North Little Rock. He’d weave elaborate tall tales about his magical excursions gliding over the jungle canopies of Sierra Leone, or wrestling boa constrictors, or floating aloft past my bedroom window at night to check up on me. Grandaddy had a way of blending the fact and fiction of his past into a magic realism that left me curious and amazed. Among many things, he taught me that Superman’s powers could open stubborn pickle jars, that you could pick a decent watermelon by thumping it, that golf was a dumb but fascinating sport, how to solve crossword puzzles, how to drive a car, and that it would suffice in life to have all of what you need and most of what you want. On one topic, however, he could frustrate me to no end. As a child, I had a defiant desire to live my life optimistically colorblind. Grandaddy, however, seemed determined to judge the world based on black and white. I didn’t see it then, but I’ve begun to think that maybe we both were right. When you’re a black person born and raised in the American South, navigating whiteness is an acquired life skill. In school you might watch movies about the assassination of Medgar Evers at the hands of a white supremacist, read chapters in your books about white mobs throwing Molotov cocktails into buses filled with Freedom Riders, or hear about the carnage on the Edmund Pettus Bridge. But even before this formal education begins, you can feel the weight of the South’s Jim Crow past. It envelops you like a hot wet blanket on a humid Arkansas summer night. The author’s grandfather, Calvin, and grandmother, Lucy. Photo courtesy of Myah Genung. I felt ashamed, those nights, when my mother asked if I made any friends at school. I only reluctantly recounted my experiences. She would tell me that the girls and boys treated me this way because their parents taught them to. White hostility toward blackness was a symptom of a hereditary disease, passed down through generations. My mother wasn’t angry with the world, but rather sorry to see her daughter experience the only slightly faded shadows of the same darkness she grew up with. 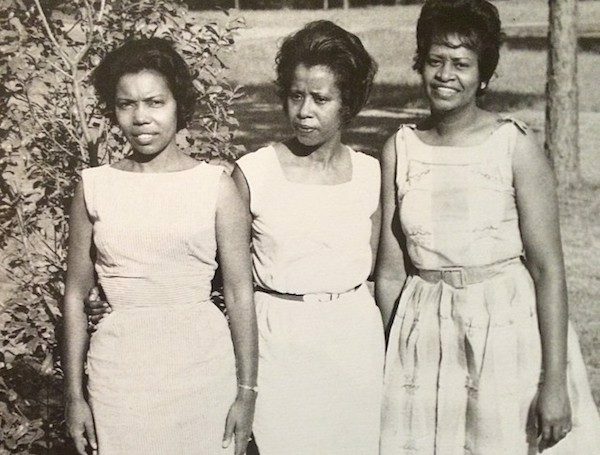 In the ’60s my mother had been one of a few black students to integrate an all-white middle school in Arkansas. She was 12 years old and determined to make a good impression. She would defy the preconceived notions harbored by racist whites that black kids from the “other side of the tracks” were unlearned, uncouth, and unworthy of friendship. Still, her lunches were spent at a table alone. When she wasn’t entirely ignored, she was met with cruel pranks and sneering looks. I can only imagine that watching his daughter endure this treatment colored my grandfather’s approach to raising me. Grandaddy was born in North Little Rock, Arkansas in 1924 in a house near the train tracks. His skin was the color of coffee with no cream, and he had three sisters of the same hue. In his old age my sister Faith and I were the apples of his eye—and over the course of 88 years his eyes saw a lot. At 19, Grandaddy was drafted into the segregated U.S. Army and shipped overseas to serve in Wales, France, and Germany. His all-black regiment’s shoes and socks were secondhand. When their train passed through town, French locals jeered at the soldiers and called them “monkeys.” Eventually, Grandaddy said, he and his friends would just lower the train-car window curtains. Out of sight, out of mind. After three years abroad in service he returned home to more of the same. He had to pick up prescriptions at the local pharmacy’s back door. He had to sit at the rear of the bus. Thanks to the GI Bill, Grandaddy enrolled at Philander Smith College, a historically black school in the area, where he met my grandmother. 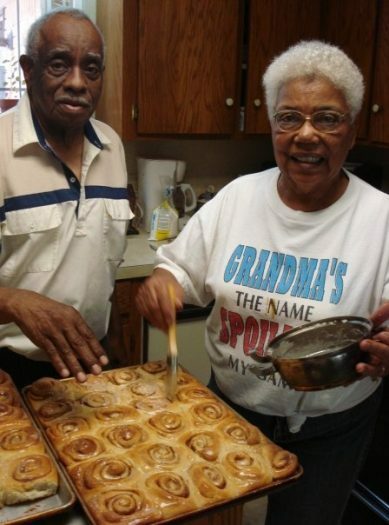 They married in 1949 and moved to Glenview, one of the few subdivisions of North Little Rock where blacks could purchase property. My grandfather taught English and became the principal of the elementary school I later attended. He and Grammy never left their little red brick house on Glenview Boulevard. My family and I followed a different path. When I was eight years old we moved to Los Angeles, and I saw colors beyond black and white for the first time. There I met kids with last names like Mohamed and Cheng, who worshipped on prayer mats or not at all. My fourth grade classroom resembled an ad for United Colors of Benetton. I felt at home in a Technicolor world where my skin didn’t determine who could be my friend. 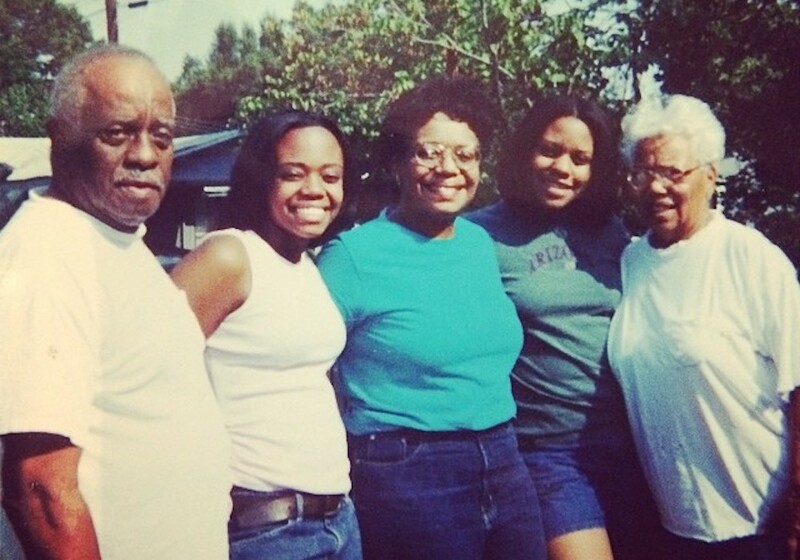 The author’s grandmother, Lucy, and two of her granddaddy’s sisters, Rio and Minnie. Photo courtesy of Myah Genung. “The opportunity to get your hat and run,” Grandaddy liked to add, with a chuckle. It didn’t occur to me, back then, that this was a coping mechanism he’d crystallized over time: Assume you will be greeted with prejudice and the inevitable outcome will sting less. It also didn’t occur to me that he was not entirely wrong. Decades of legal discrimination and indoctrinated prejudice manifest in myriad forms and to varying degrees, and they don’t disappear overnight. When I was six years old, I represented my class during a live press conference with President Bill Clinton, the Arkansas native after whom my school, William Jefferson Clinton Elementary, had been named. I wasn’t called on during the press conference but had prepared a question just in case. I’d taken to painting and wanted to ask him if he knew the primary colors—red, blue, and yellow. I have a vivid memory of walking alone through the double doors of my elementary school that day, hoisting my backpack onto a conveyor belt and watching it glide through the silver screening machine. The Secret Service waved the scanning wand across my red pleated dress and down to my brand new black patent Mary Janes. Meeting the President is a daunting occasion for any American, let alone a kindergartener. But in our family, little girls who meet the President had to look the part—and my mother made sure I did. 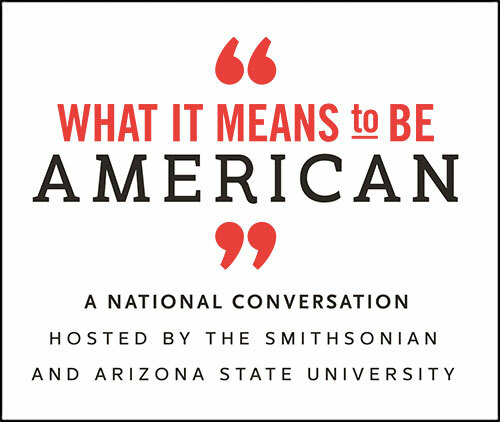 Today I see this as an extension of the lessons that my grandparents taught my mother when she was set to integrate that hostile all-white school. Speak well. Dress well. Ask intelligent questions. Prove them wrong. It didn’t matter so much that it was 1994 and segregation was a thing of the past. The tension lingered on. I scoffed at his sense of resignation to the way things had always been. One night during the first week of sixth grade I came home from school excited to tell him about my new friends. “Are they black or white?” he asked. It’s kind of funny that President Clinton, who’s clearly white, was honored as the “first black president” at a dinner for the Congressional Black Caucus in 2008. Clinton took kindly to it. It was a recognition of a mutual affinity he seemed to develop with the black community. He, too, had grown up in the South and had struggled to make ends meet. He had befriended Vernon Jordan, played the saxophone, and loved Southern barbecue. He enlisted Maya Angelou to recite her poem, “On the Pulse of Morning,” before he was sworn in on the National Mall. He was a powerful white man who seemed at ease with black America. History has rightfully trained a more critical eye on Bill Clinton’s policies and their effects on black society. But back then older Southern blacks, like my grandfather, accepted him as openly as he embraced them. He was “The Man from Hope,” one of the “few exceptions” Grandaddy had told me about. Bill Clinton wasn’t a black President, but in my grandfather’s eyes, he was likely the closest we’d get. At age 18 I left Arkansas still defiantly optimistic that more was possible. This was around the time a young senator from Illinois named Barack Obama was challenging Hillary Clinton for the Democratic nomination to be President. Grandaddy didn’t expect Obama to win even the nomination, much less the presidency. On Election Night 2008 I called Grandaddy from a jubilant and chaotic Times Square in New York City. By this time, I was a sophomore at New York University. Barack Obama had just been elected. With tears in my eyes and tightness in my throat, I shouted into my flip phone, “Grandaddy, can you believe he won?” I couldn’t make out all of his words but from the sound of his voice I knew he was smiling and that his deep set eyes, made blue with age, were beaming. America had elected its first actual black president, against all the perceived odds. Grandaddy died in 2012. I’ll never forget something my great-aunt Rio told me after his funeral: “You know he loved you, fiercely and with all of his heart.” I did know this—and it explains the lengths he went to prepare me for the world’s bitter surprises, even when it meant we butted heads on politics and race. I also have the comforting memory that, for one fleeting moment, I felt my grandfather see the world through my defiantly optimistic eyes. Myah Genung worked several years in the film industry before joining a nonprofit organization based in Los Angeles. She has a Master's degree in specialized journalism for the arts and studied film as an undergraduate in New York. Primary Editor: Eryn Brown. Secondary Editor: Siobhan Phillips.